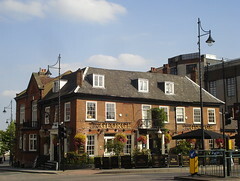 Stonegate pub in South Woodford. The interior is fairly open plan, wrapped around the bar. An area to the side behind a wood and stained glass room divider has a more peaceful atmosphere, with padded brown leather banquette seating and glass display cabinets backed with fake cardboard "leather-bound books" — though there's a flatscreen somewhat incongruously mounted on the abovementioned room divider, facing into this side room. Another flatscreen is in the main bar area. There's a large patio garden out the front and another smaller one under cover out the back. Kake visited on a Sunday afternoon in September 2014. Three of the six handpumps were on, offering Greene King IPA, Sharps Doom Bar, and London Fields Love Not War. A pint of lime and soda was £1. There were a fair few people in at 3:30pm; quite a lot of them were on the front patio, but a good contingent were in the bar area watching lacrosse on the flatscreen, and two or three were sitting quietly in the side room. Music was playing, fairly unchallenging and not too loud. The feel was definitely that of a chain pub, but a decent enough one. Food is served from a (probably chain-wide) menu photo of menu in September 2014. Accessibility: A small ramp to get in at the front entrance (steps at side entrance). Bar, seating, and accessible toilet on the same level, other toilets down five steps. Last edited 2015-09-12 14:00:46 (version 2; diff). List all versions. Page last edited 2015-09-12 14:00:46 (version 2).